In celebration of 81 years since the advertising agency first opened its doors, Leo Burnett’s Chicago office hosted Urban Initiatives and other Chicago non-profits as part of “Give Back Day” on August 5. In partnership with Give2Get, Leo Burnett provided Urban Initiatives with the opportunity to highlight our impact on underserved Chicago communities and directly engage Leo employees in activities that would benefit participants in Urban Initiatives’ programs. Leo Burnett employees stopped by Urban Initiatives’ stations to chat with the organization’s staff about the our vision of empowering children to become agents of change and our sports-based youth development programs. Leo volunteers helped to stuff hundreds of bags for our kids in anticipation of the rapidly-approaching first day of school. 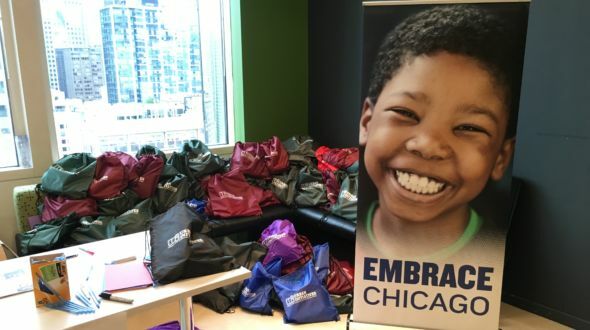 The bags contained a number of supplies and goodies, ranging from socks and sunscreen to Blackhawk-themed loop drinking straws and Chicago Cubs-branded foldable water bottles to frisbees and baseballs. A huge thank you to Leo Burnett employees for supporting students in Chicago schools and Give2Get for helping to organize the event! Previous Article: Team UI Runner Profile: Meet Gene!